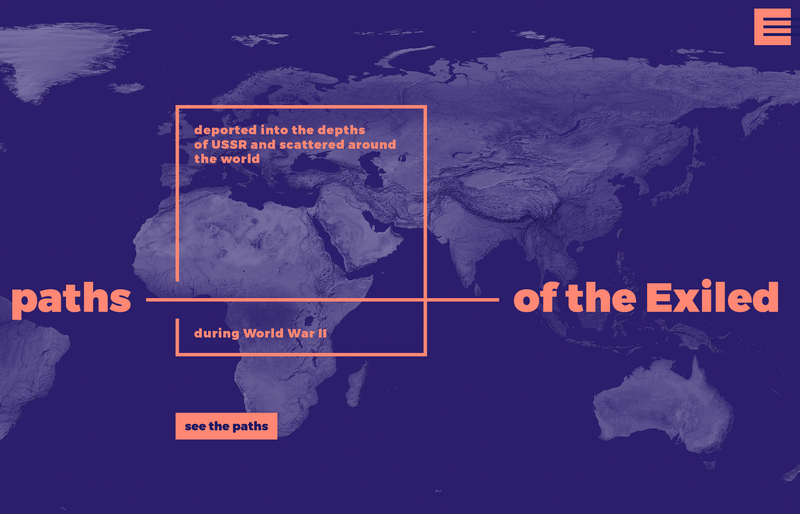 The Paths of Exiled - the history of Poles deported from 1940 to 1941 into the depths of USSR and their further wanderings around the world is a project run by The KARTA Center Foundation and Open Culture Studio. Superskrypt was responsible for the graphic design, UX and architecture implementation of the website. The project was delivered over two months using iterative agile methodology. In 2017 four concepts of digital tools based on digitized heritage resources were created at the Open Culture Studio. Four teams were established to work on these projects, representing the following institutions: the Polish History Museum, the National Museum in Warsaw, the Museum of Warsaw and the KARTA Center. The Paths of the Exiled has been chosen by the Internet users as one of the two implemented projects. An interactive map of the world and the timeline allow to trace the fates of the exiled. Depending on the selected time range the map shows routes that Poles have followed in a given period. The description of each person includes information about completed route and time spent away from the family home. The story is told through archival sources: memories, diaries, audio biographical accounts, photographs and iconographic materials. The materials are divided into 3 sections: PLACE [MIEJSCE], MEMORIES [WSPOMNIENIA] and PATH [SZLAK]. An animated narrative presenting the history of 300,000 Poles exiled in 1940–1941 by the Soviets and their path to freedom. The narrative presents the data, records & content from the largest social archive in Poland: The KARTA Center (Ośrodek Karta).